Here is Luis Arturo Vasquez, the sleazebag wuss who attacked Sukhvir Singh Ji on Thanksgiving. Stay tuned; he gets sentenced in April and the prosecutors are asking for the maximum sentence of two years, plus a demand that he pay for all of his victim's medical expenses. A Kent man who attacked a taxi driver and called him an "Iraqi terrorist" last fall could now face two years in prison. Luis Arturo Vazquez, 21, pleaded guilty this week to second-degree assault and malicious harassment -- a hate crime -- for the November attack, which left cabbie Sukhvir Singh with a concussion, cuts on his face, bite marks on his scalp and other injuries. 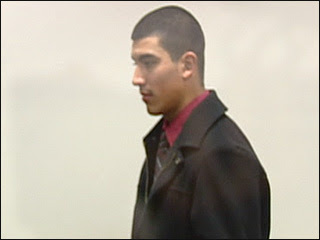 King County prosecutors will ask for the two-year term when Vazquez is sentenced April 18. Vazquez was drunk and had been kicked out of the Apple Cup football game at Husky Stadium when officers spotted Singh's cab and asked him to give the man a ride home on Nov. 24, according to court documents. Vazquez attacked Singh as they headed south on Interstate 5, prompting Singh to pull over in the car pool lane. Police say Vazquez punched and bit Singh, pulling out tufts of his hair as he threatened him and called him a terrorist. TUESDAY, NOVEMBER 27 The week continues with a galling saga from the streets of Seattle. The instigator: Luis Arturo Vazquez, the 20-year-old Kent man who first attracted the attention of law enforcement on Saturday night, after he was ejected from Husky Stadium during the Apple Cup. Following his ejection, Vazquez reportedly tried to force his way onto a Metro bus, at which point state troopers arrived and were nearly driven to subdue the aggressively belligerent Vazquez with Taser stun guns. 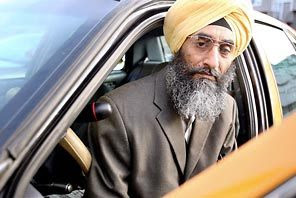 Instead, the Seattle Post-Intelligencer reports, cops opted to place Vazquez in the taxicab driven by Sukhvir Singh, a 48-year-old Seattle man and observant Sikh. As the P-I reports, "Sikhism is the fifth-largest world religion, with about 10,000 followers in Seattle. As part of their faith, Sikhs do not trim their body hair and wrap hair on their heads under a turban." Perhaps the turban is what set off Vazquez. According to police reports, as Singh was driving Vazquez home, the latter launched into a tirade of epithets and allegedly began punching, choking, and biting Singh, whom Vazquez reportedly called an "Iraqi terrorist" before knocking off his turban and tearing out clumps of his hair. When Singh tried to flee, the beating continued in the road, with numerous eyewitnesses on a nearby Metro bus calling 911 to report the attack. Today, Vazquez was charged with third-degree assault and malicious harassment—the state's hate-crime charge—for which he faces up to a year in jail. As for Singh: He was briefly hospitalized for injuries including a concussion and bite marks on his head; according to friends, he has not been able to stop vomiting since the assault. He's not alone.